Allows to define product and sub-product. Allows to link components to product. Id Unique Id for the product. Product type Type of product. Designation Trade name of the product known outside the company. Customer The customer the product should be delivered to. Prime contractor The contact, into customer organization, who will be responsible for the product delivery. Responsible Person responsible for the product. Is sub-product of Name of the top product if this product is a sub-product. Closed Box checked indicates the product is archived. Description Complete description of the product. List of versions defined for the product. Product versions are defined in Product Versions screen. List of sub-products for the product. See: Relationships between product and component elements. Displays the structure of the product. Box checked “Show versions for all structure” allows to display versions of sub-products and components. Box checked “Show projects linked to versions” allows to display projects linked. Allows to define versions of a product. Allows to link a component version to product version. Allows to link the product version to a project. Possibility to define if the version name is automatically produced from the product name and version number. Set global parameters to activate this feature. Else, the version name will entered manually. Id Unique Id for the version. Product The product on which the version applies. Version number Version number of the product. Name Name of the version. Prime contractor The contact, into customer organization, who will be responsible for the version delivery. Responsible Resource responsible of the version. Entry into service Initial, planned and real entry into service date of the version. End date Initial, planned and real end dates of the version. Description Complete description of the version. The field “Version number” appears only if the global parameter “Automatic format of version name” is set to Yes. The field “Name” will be read only. Can be different from product prime contractor. Specify the date of entry into service. The box “Done” is checked when the real date field is set. 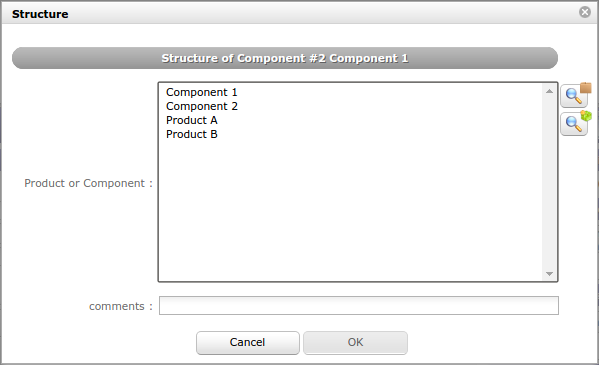 Allows to define product components. Allows to define products using the component. Id Unique Id for the component. Identifier Another name to identify the component. Responsible Person responsible for the component. Closed Box checked indicates the component is archived. Description Complete description of the component. List of versions defined for the component. Component versions are defined in Component Versions screen. Allows to define versions of a component. 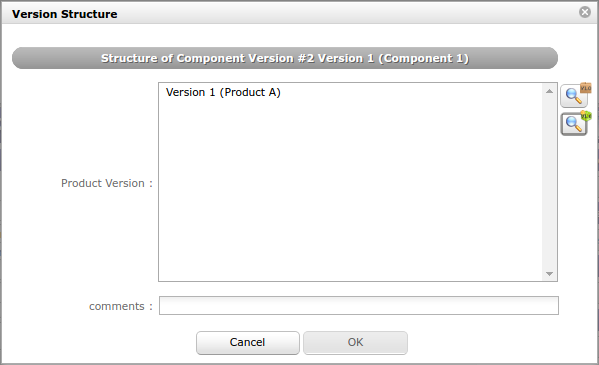 Allows to link a product version to component version. Possibility to define if the version name is automatically produced from the component name and version number. Component The component on which the version applies. Version number Version number of the component. Allows to manage relationships between products and components to define product structure. Click on to create a new relationship. The dialog box “Structure” appear. Click on to delete the corresponding relationship. Allows to define links between versions of products and components. Only with the elements defined in the product structure. Click on to create a new link. The dialog box “Version Structure” appear. Click on to delete the corresponding link. This section allows to manage links between projects and versions of products. Click on to create a new link. Click on to update an existing link. Project The project linked to product version or the project list. Product Product linked to the project or the list of products. Version Product version linked to the project or list of product versions. Start date Start date for validity of the link. End date End date for validity of the link. Closed Box checked indicates the link is not active anymore, without deleting it. From the screen «Projects», the fields «product and version» will be selectable. From the screen «Product versions», the field «project» will be selectable.